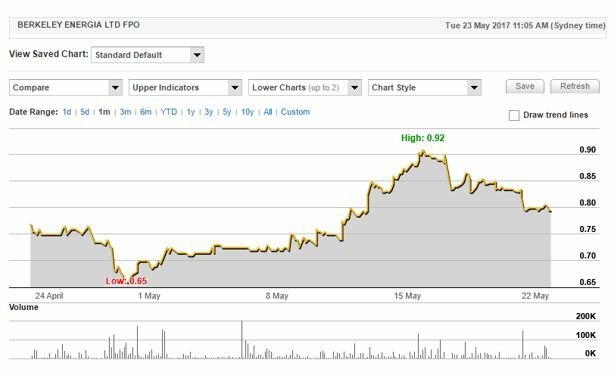 After shares in emerging uranium producer, Berkeley Energia (ASX: BKY) doubled from circa 60 cents in mid-2016 to hit a high of $1.20 in late January, they have retraced significantly in recent months, hitting an intraday low of 65 cents in late April. It should be noted here that share trading patterns should not be used as the basis for an investment as they may or may not be replicated and the broker projections and price targets within this article are only estimates and may not be met. Those considering this stock should seek independent financial advice. 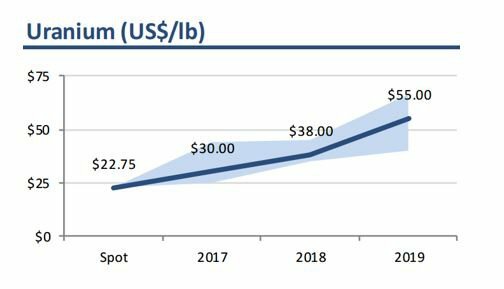 As indicated below, there has been a trailing off in the spot uranium price in the last few months after a sustained decline from circa US$35 per pound at the start of 2016 culminated in it bottoming out around the US$20 per pound mark in the last quarter of calendar year 2016. The rebound to circa US$27 per pound in the first quarter of 2017 quickly fizzled out and the commodity is now trading in the vicinity of US$22 per pound. While these commodity price gyrations have no doubt impacted BKY’s share price, one needs to question whether this should be the case given the group’s Salamanca project won’t be coming into production until 2019. Furthermore, BKY’s All in Sustaining Costs (AISC) will be at the bottom end of the cost curve, indicating that it can still make reasonable margins at the current price, whereby many of its competitors/pending developers are in a position where they will have to close mines or terminate projects if these prices prevail. With regard to BKY’s entry into the market as a producer in 2019, the following projections by prominent commodity research house, PCF Capital are arguably of more significance than the current spot price. Perhaps this explains the rebound in BKY’s share price over recent weeks. While the uranium price has fallen from approximately US$22.70 per pound to US$21.70 per pound since the start of May, BKY’s share price has defied the trend, increasing 40% as indicated in the chart below. This movement in the share price hasn’t been driven by any significant news flow from the company during that period of time. Management has confirmed that pre-construction activities are going to plan, but that couldn’t be deemed market moving news. What could be at the heart of the share price rerating is a recognition of the fact that BKY needs to be valued in accordance with the market dynamics that will be prevailing as it comes into production in 2019. This should firstly include a better pricing environment, and on this note it is worth bearing in mind that BKY has already negotiated a binding offtake agreement with Interalloys Trading for the sale of first production from the Salamanca mine. In November, the two parties converted a previously announced Letter of Intent (LOI) into a binding offtake agreement that included a doubling of annual contracted volumes to a total of two million pounds over a five-year period at an average fixed-price of US$43.78 per pound. At that stage this compared with the spot price of approximately US$18 per pound, indicating where end users see the price heading in the near to medium-term. Harking back to the recent share price movement though, an examination of BKY’s estimated All in Sustaining Costs for the Salamanca project compared with global peers perhaps provides some further explanation in relation to its recent resilience. The following demonstrates BKY’s far superior operating costs profile compared with its peers, and it also indicates (right-hand graph) that there are several prospective new projects that would be currently operating at a loss in today’s pricing environment. Should a low price environment prevail, not only would BKY be one of the last mines to have to close, but the supply side of the market would be extremely constrained if new projects are mothballed and existing projects are shut down. 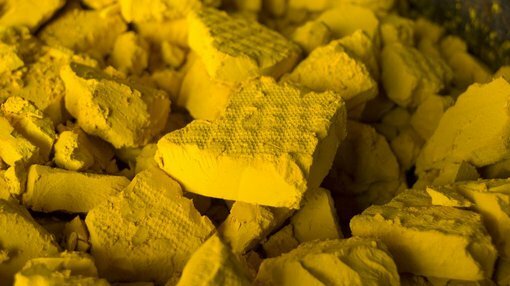 This would effectively have the impact of placing upward pressure on the uranium price, which would eventually restore equilibrium in an ideal supply demand environment. 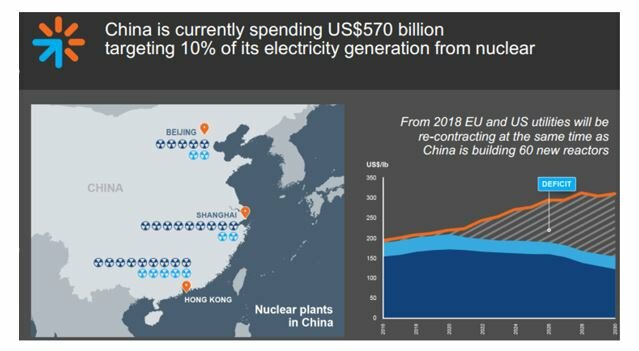 Looking at the demand side, the post-2019 outlook appears bright as European and US utilities are forced to re-contract at the same time as China is ramping up its nuclear power generation capacity. The anticipated deficit which is expected to emerge in 2020 and broaden substantially by 2024 can be seen below. This further demonstrates that BKY’s implied valuation shouldn’t swing with the ebb and flow of spot commodity prices at this point in time. A number of brokers cover BKY with the general consensus being that the stock is undervalued at current levels. 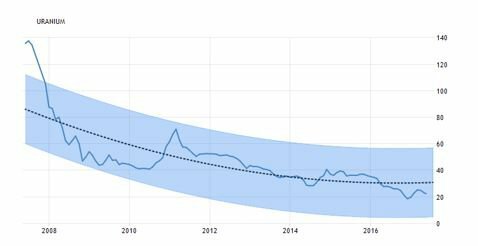 The consensus 12 month price target is currently $1.29, and this is in line with Morgans CIMB projections. The broker ran the ruler across the stock following the December quarterly report, and taking into account the offtake agreement it reaffirmed its add recommendation with its price target implying upside of circa 60% to Tuesday’s opening price of 81 cents.